To propose, encourage and facilitate activities of the IMU or other bodies which would tend to increase the visibility of women in mathematics and lead to an increase in their representation in the community at all levels and in all parts of the world. 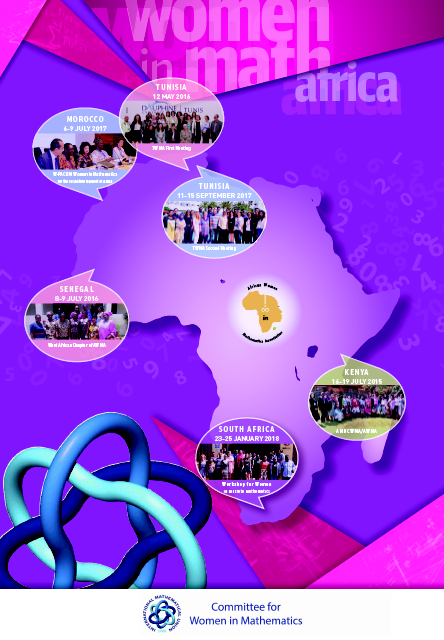 To promote international contacts between national and regional organisations for women in mathematics, in particular facilitating the building of networks at the regional or continental level. To provide a website which is a repository of information for and about women in mathematics worldwide and to enable efficient communication among the international community of women mathematicians. The CWM 2019 call for Networks and Schools received 41 applications of which CWM decided to support 7 in Cameroon, Argentina, Domicican Republic, India, Indonesia, South Africa and Tunisia. See more here. Remember Maryam Mirzakhani is an exhibition with 18 original poster. Institutions interested in hosting the exhibition can consult the rules of use and contact CWM at exhibition-cwm@mathunion.org. 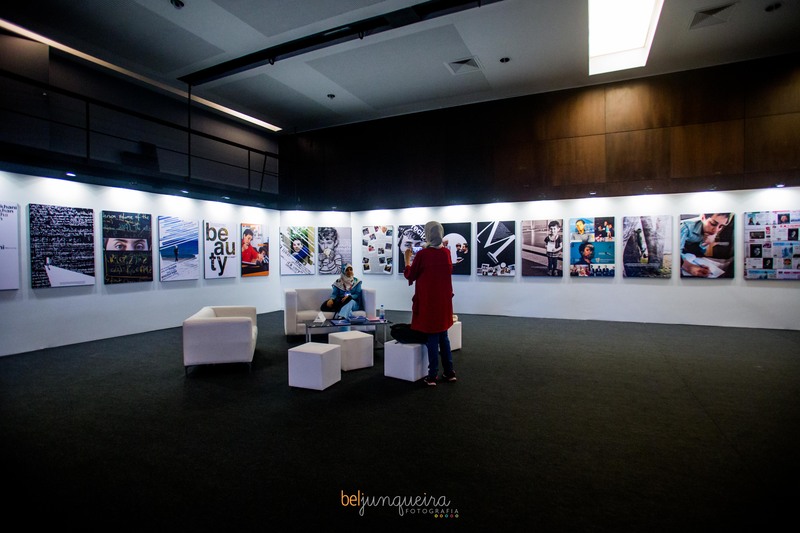 The exhibition opened at (WM)², the World Meeting for Women in Mathematics, and remained open during ICM 2018. It contained also a book of condolences, and volumes with Maryam Mirzakhani's mathematical papers as well as a book with papers about her. Curator: Thais Jordao. Designer: Rafael Meireles Barroso. CWM organized a satellite meeting of ICM 2018: (WM)²: World Meeting for Women in Mathematics. It took place in the same venue as the ICM in Rio, on July 31 2018. This meeting report summarizes the main activities. This book of abstracts contains abstracts of invited lectures, mathematical posters and posters relating to the general topic of women in mathematics. A CWM Panel that took place at ICM Rio on August 2 2018. Brief presentation about IMU CWM by Marie-Francoise Roy, a lecture by June Barrow Green (Open University, UK) "Historical context of the gender gap in mathematics" and a lecture by Silvina Ponce-Dawson (University Buenos Aires, Argentina) "The International Union of Pure and Applied Physics Working Group on Women in Physics: activities and perspectives" followed by reactions from the floor. An edited sequence of film clips of women saying into the camera "I am (name) from (country), and I am a mathematician!” in the language of their choice. 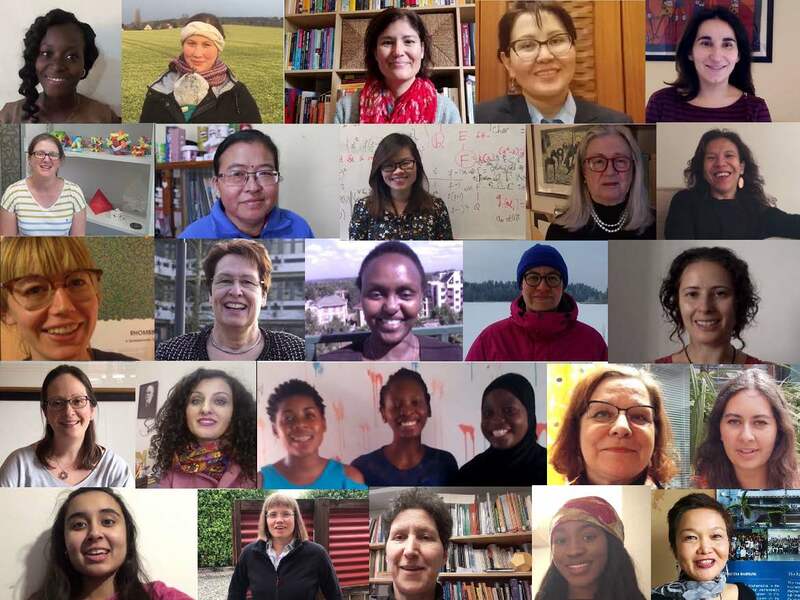 The 146 clips featured 243 women mathematicians from 36 different countries speaking in 31 different languages. Authors Eugenie Hunsicker and Irina Linke. Members of the CWM are appointed for four years by the IMU Executive Committee and are widely distributed internationally. The CWM has a chair and vice--chair and 6 to 8 members--at--large. One of the CWM members is responsible for the CWM website and electronic communication. The 2018 Global Survey of Mathematical, Computing, and Natural Scientists has been launched on May 1st, 2018 and will be open for answers until October 31st, 2018. 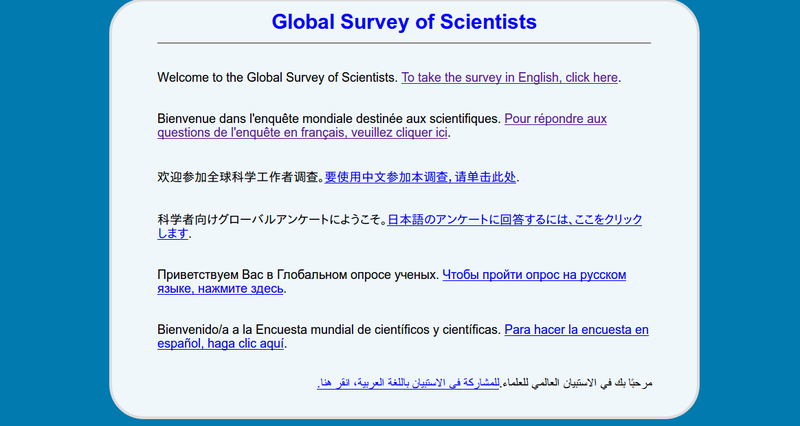 Click to complete the 2018 Global Survey of Mathematical, Computing, and Natural Scientists. You are welcome to forward this link to the survey to your colleagues, both men and women. CWM posters and flyers are available. If you want to get a few copies to distribute at a mathematical event or for other display purposes, please contact your CWM country's ambassador. 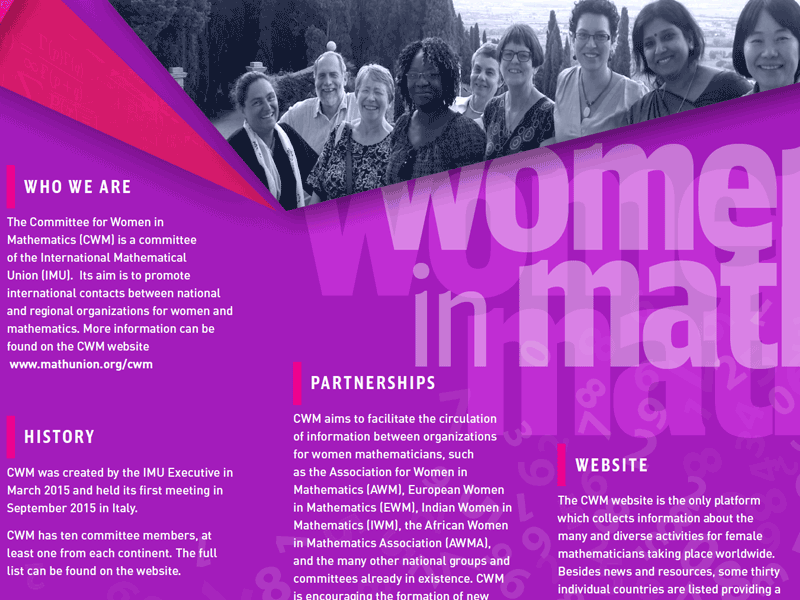 CWM is using its sponsorship to help establish and foster networks of women mathematicians especially in Asia, Latin America and Africa. From 2015 to 2019, CWM sponsored events took place in Colombia, India, Indonesia, Kazakhstan, Mexico , Senegal, Tunisia , Kenya, Brazil, Canada, Chile, Iran, Japan, Morocco, Nepal, South Africa ,Vietnam, Austria, El Salvador, Ethiopia, Italy (ICTP), Macedonia, Nigeria, Uruguay, Uzbekistan, Cameroon, Argentina, Dominican Republic. CWM random collection of photos of women mathematicians. Just to make you realise how many women in mathematics there are, who have overcome the multitude of obstacles placed in their paths. Suggestions for CWM News items can be sent to cwm.info@mathunion.org. CWM News Archives can be found here. CWM organized a satellite meeting of ICM 2018 (WM)² World Meeting for Women in Mathematics. It took place in the same venue as the ICM in Rio, on July 31 2018. This meeting report summarizes the main activities. This book of abstracts contains abstracts of invited lectures, mathematical posters and posters relating to the general topic of women in mathematics. 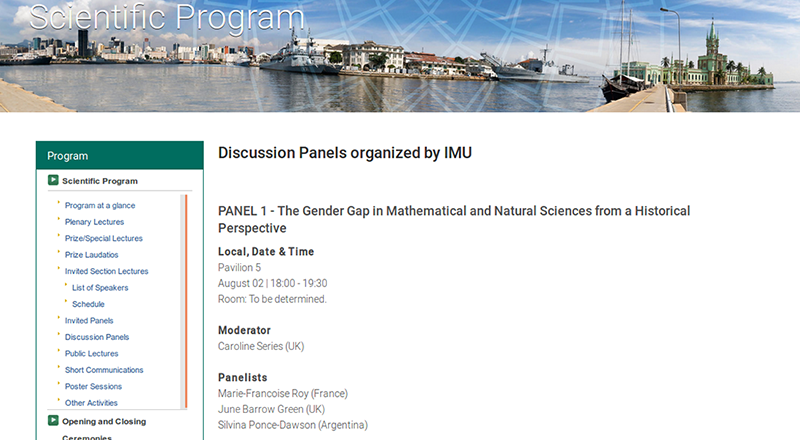 CWM is leading the project "A Global Approach to the Gender Gap in Mathematical and Natural Sciences: How to Measure It, How to Reduce It ?" funded by the International Council for Science (ICSU). CWM printers and flyers are available. The flyer is two sided and is designed to be folded along vertical lines into three. If you want to get a few copies to distribute at a mathematical event or for other display purposes, please contact your EWM country's ambassador. Organizations for Women in Mathematics are listed in alphabetical order by country here. There are also trans-continental organizations for Africa (AWMA) and Europe (EWM). The USA based AWM has many international members. There are many mathematical events held each year organised by and specifically aimed at women mathematicians. Here is a sample, listed with the most recent first. Please contact us with details of any relevant events, past or future, that you would like to suggest we add. CWM random collection of photos of women mathematicians. Just to make you realise of how many women in mathematics there are, who have overcome the multitude of obstacles placed in their paths. 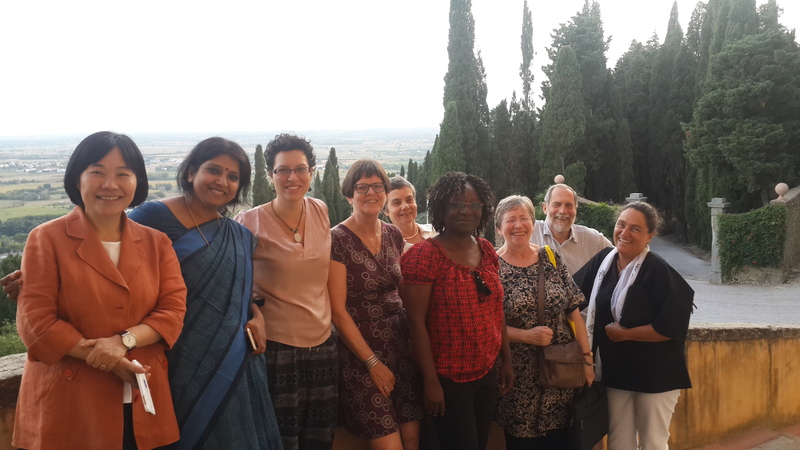 CWM cooperates with the Organisation for Women in Science in the Developing World (OWSD). OWSD is one of the 11 partners of the Gender Gap in Science project. The EMS's CDC is offering female african women mathematicians small top ups to EMS-Simons Foundation grants for collaborative research visits, see here. Other IMU CDC grants which may be of interest can be found here.